It’s a good zinnia growing year. Zinnias, Zinnia elegans are the star of the summer flower show. For filler and contrast, try adding herbs, or coleus. It doesn’t always have to be leather leaf ferns or baby’s breath. Red and gold zinnias with coleus in an antique watering can. Summer-long blooms bring butterflies and pollinators to the garden. Zinnias meant “thoughts of an absent friend.” in the Victorian language of flowers. “Signet Starfire” marigolds. grown from seed. Little yellow and orange dwarf single marigolds keeps blooming until frost. Red and white zinnias with coleus make a simple bouquet. Zinnias were named 1763 by Linnaeus in honor of Johann Zinn, a German professor of botany and medicine. 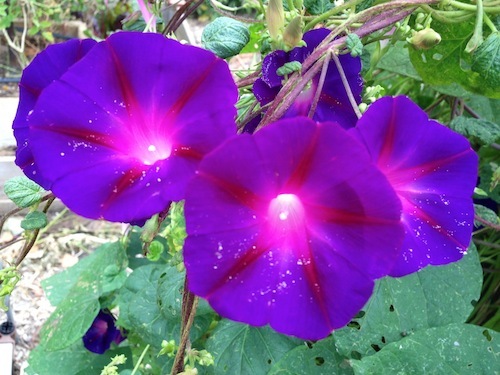 These crayon colored flowers are long-stemmed cutting flowers with long-lasting blooms. To extend the life of cut flower blooms by trimming off the bottom of the stem, every few days. Replace the water with fresh every 4 days. Zinnias with oregano and basil. Cutting Zinnia, “Bling Bling.” These lovely cut flowers are bigger and brighter every year. Disease resistance has much improved through the years. Pink zinnias and Queen Ann’s lace. If it’s been awhile since you’ve included zinnias in your garden, take another look. Zinnias are disease resistant rebloomers that will keep you in flowers until frost. How to save left over seed. Keep any extra seed to use next spring. I got all the zinnias in this post from Renee’s Garden. I am having big juicy tomato success on My Garden Post. These are the tomatoes that I am growing. The best choice for My Garden Post are plants that are less than 2 feet tall. Determinate tomato varieties grow to a limited hight and usually do not need staking and caging. Choose dwarf or bush type tomato plants. Look for plants bred for containers. Extended release or slow release fertilizer applied when potting the plant will be one less thing to worry about. Bush 506 Container Tomato plants are less than 24″ tall. The thick stemmed plants easily support the 8 ounce fruits. These container grown tomatoes are early producers. The Tasteful Garden advertises tomatoes in only 62 days. It was the first regular sized tomato to ripen in my zone 6 garden. New Big Dwarf heirloom tomato. The heaviest producer of full size tomatoes so far. New Big Dwarf Heirloom tomato is not really new. An heirloom first introduced in 1915, tastes like the old-fashioned beefsteak. The plant is only 2 feet tall but the fruits are full-sized 8-12 oz. Expect early tomatoes in about 60 days. Bush Steak Tomato is an easy-to-find small tomato plant or grow it from seed. “I often recommend the Bush Steak tomato and suggests planting in the large planters. The Bush Steak Tomato matures at 20 inches in height, and produce a medium size tomato in large numbers,” says Oliver J Gardner, Director of Sales and Marketing, My Garden Post. Litt’l Bites Container Cherry Tomato – keep this early producer well watered and fed for tons of sweet cherry tomatoes all summer long. 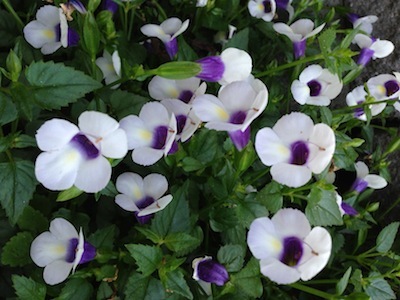 A compact, lush plant that is perfect for My Garden Post or hanging baskets. Litt’l Bites grows 20 inches wide and 12 inches tall. Learn more about My Garden Post here. My container grown tomatoes benefit from the easy-to-set-up and use My Garden Post irrigation system. It’s the best system I’ve used on the deck or patio. Adjust the timer to accommodate the season; longer daily watering when it is the hottest. C. L. Fornari posted a photo of her summer office on facebook that made me smile. She is the inspiration for the following photos of my outdoor office which is also the library. Morning coffee is served on the patio. I step out of the kitchen and onto the patio for coffee most mornings. A variety of mints and herbs grow around the patio. It is the ideal place to set the sun tea jar early in the day. Hummingbirds love the flowers and hanging baskets. Some of the patio plants are trial plants from Proven Winners. They hang from the pergola on the patio so I can keep an eye on what’s new. The flowering nicotiana and giant overgrown celosa attract the pollinators and bummers. Privacy Screen of purple morning glories. There’s always coffee or iced tea at the “office”. On the deck, a drip irrigation system keeps the plants looking good. Every spring some bird of some kind will decide to make a nest and raise a family on deck. A huge cypress tree provides shade and refuge for the songbirds and hummers. Gardening and writing about gardening are always best done outside. Extended release fertilizer was added when the baskets were planted. The secret is to keep the plants well watered. I love July. Everything is green and growing. The bugs and drought haven’t gotten to everything yet. 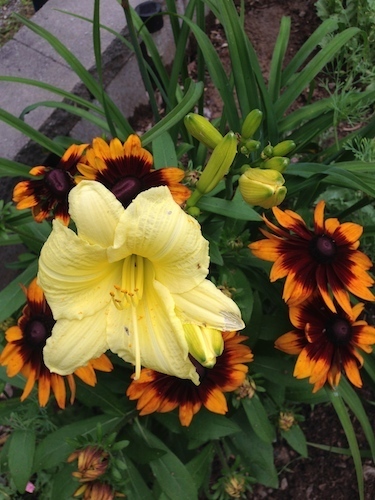 This is ‘Going Bananas’ Daylily is a Hemerocallis from Proven Winners crowded into a patch of Black Eyed Susan . Others see how beautiful they are. I see more work. 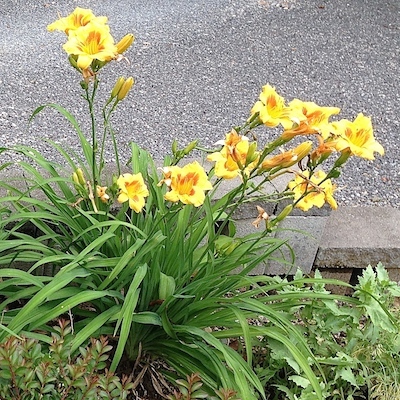 These daylilies already need to be thinned out. Black-eyed Susan “Chocolate Orange” is a dark chocolate color outlined by bright orange. Strong stems and showy long-lasting flowers are perfect for cutting. It is a lovely shade of yellow. 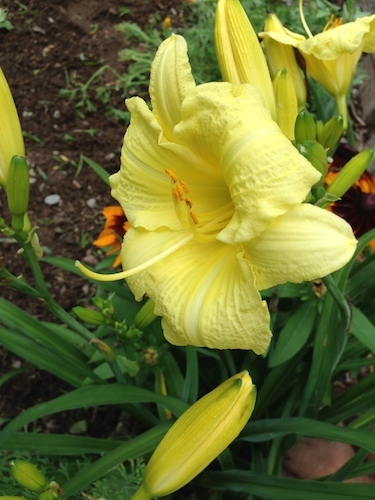 There are three different yellow daylilies blooming in the garden now. Miss Mary Mary Is blooming single blooms now. Next it will be double blooms on the same plant. Black-Eyed Stella an old favorite for good reason. To introduce this flower to the public, they were giving away Black Eyed Stellas. We stood in line, a long, long line, for a long, long time to get that little dayllily. Finally at the front of the line, I was handed a scrawny bare root plant. I figured it would die before I could get home and plant it. It thrived and multiplied and multiplied. It wasn’t long before there was a 3-foot wide border along the back of the house. Plus, for 6 years, I potted up 25 clumps to sell for the garden club every spring. 20 award-winning daylilies have been selected for the coveted All-American title for their scientifically proven and superior performance nationwide by the All-American Daylily Selection Council (AADSC). 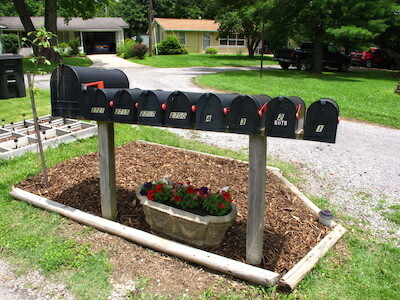 The neighborhood mailbox spot is a bit of a gathering place. “We can have flowers nearly every month of the year.” ~ Elizabeth Lawrence. Carol at May Dreams Gardens started Garden Bloggers Bloom Day. What’s blooming in your garden? Share with other garden bloggers on the 15th of each month. Leave a link in Mr. Linky and the comments of May Dreams Gardens. Patriotic Petunias, red, white and blue flowers will only live as long as I remember to water them. Oct 15 was a rainy day here in Zone 6a, Southeast Missouri. Not much blooming here. And this post is a bit late. It was raining here on Oct 15. Lots of things are still growing. Since the rain, we will have to mow again. And then, it’s time leaf drop. I seems like we are a week or two behind. 4 o’ Clocks read more about the fragrant annual: Becky’s flowers. 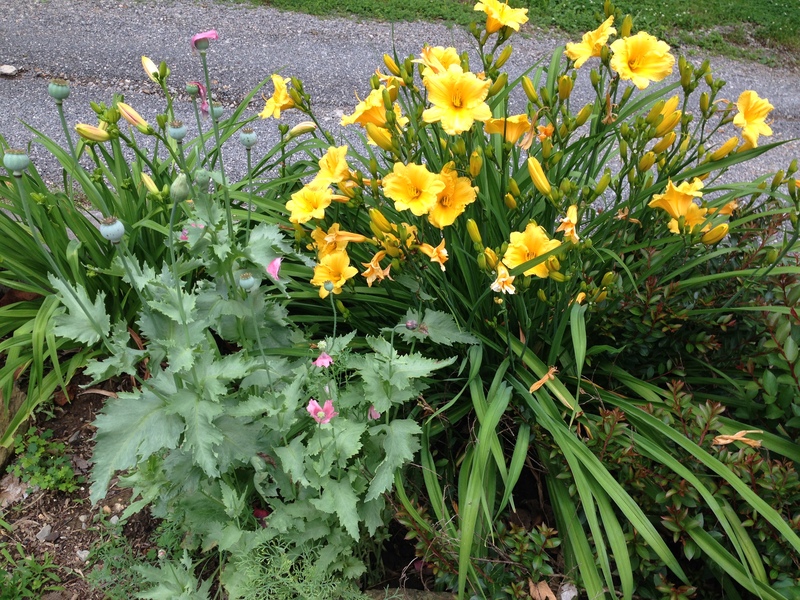 These flowers are blooming and producing lots of seed. Since they are heirlooms, the seeds will reproduce looking just like these. This summer, they out grew their space, taking over the sidewalk. There was only room for folks to walk one at a time. (No walking side by side, hand in hand.) Your job is to stroll along the sidewalk and admire the fragrant flowers. I can never have too many four o’ clocks. Grandpa Otts Morning Glories are dusted with pollen. The bees were here earlier spilling pollen on the petals. Photos PBH. 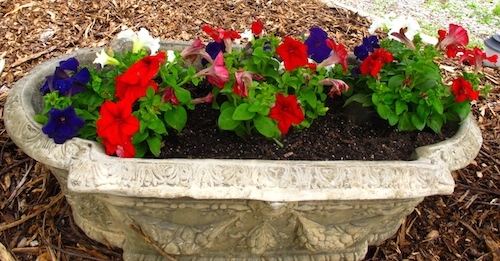 I planted three or four varieties of Mourning Glories. Twice. But it was a long, cool, very wet spring. 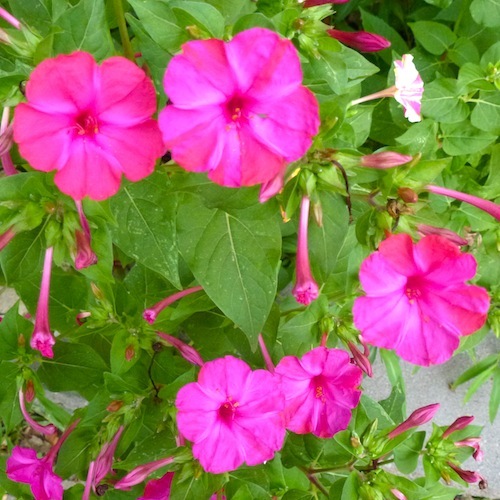 The only Glories to come up were the self seeded Grandpa Ott’s four o’clocks. As they bloom, they create a blooming privacy fence. On the North side of the patio, the street side, humming birds and bees will continue to delight up to the first frost. 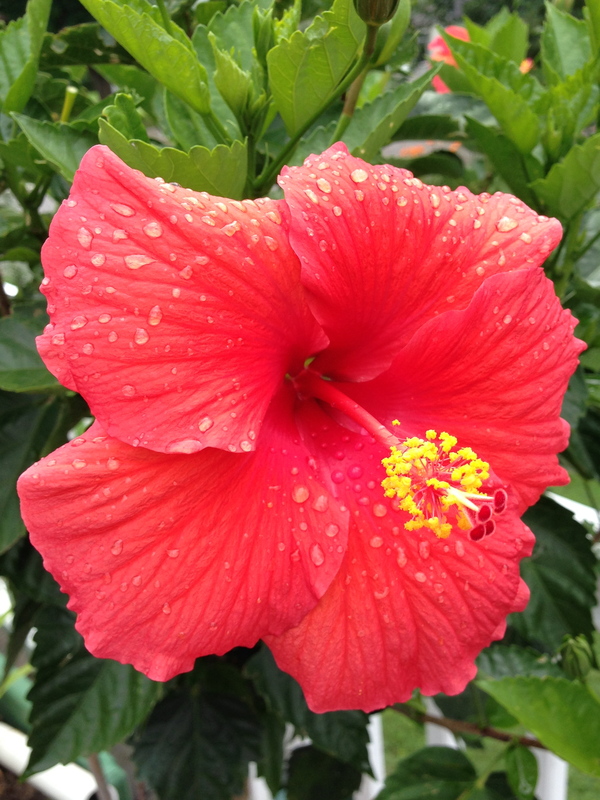 The hibiscus are in continuous bloom. Want to join GBBD? Just post on your blog about what is blooming in your garden on the 15th of the month and leave a comment to tell us what you have waiting for us to see so we can pay you a virtual visit. Then put your name and the url to your post on the Mr. Linky widget on Carols page.